A mushroom wearing armor, found near Mushroom Castle. Attacks by swinging its polearm at you. A troublesome creature holding a slate on its face. Found in Perion's Excavation Site. A viking bird found near Mushroom Castle. Attacks by screeching at you. The reanimated remains of a dead dog. As one may expect, it runs fairly fast, and can jump as well. It does not possess magic attacks, however. Lives in the remains of the tombs near Perion's Excavation Site. A mummified version of the skeledog. Relatively fast. Found in the remains of the tombs near Perion's Excavation Site. A viking bird found near Mushroom Castle. Attacks by slamming into the ground. A skeleton wearing a Brown Skull Cap and wielding a wooden club. It can club any nearby opponents, but the attack range is small. Found in the remains of the tombs near Perion's Excavation Site. Hiver sets up Mercedes, unbeknownst to her, up for a fight with Dargoth of the Black Wings. Involved in a Mercedes quest in Sleepywood. A viking bird found near Mushroom Castle on the Viking Ship. Attacks by swinging its axe at you. A viking bird found near Mushroom Castle on the Viking Ship. Attacks by swinging its mace at you. A stronger skeleton soldier, wearing a metal helmet and wielding a sword. Like Skeleton Soldier, the attack range is small. Found in the remains of the tombs near Perion's Excavation Site. Mu Young has been possessed by Lotus's ghost! Involved in Phantom quests. A red squid found near Mushroom Castle inside the Viking Ship. Attacks by slamming its tentacles into the ground. An even stronger skeleton soldier. Rides an undead horse and wears a roman style helm. Uses a poison mist attack that deals 200 damage constantly while the player is inside the mist. Found in the remains of the tombs near Perion's Excavation Site. A zombified mushroom of the jumping variety. They are alive because of the Charms of the Undead on their heads. Found in Sleepywood's Ant Tunnel Square and in Zipangu's Cemetery area. A Zombie Mushroom with an annoyed expression. They were ordinary Zombie Mushrooms until Francis the puppeteer gave them Zombie Mushroom dolls. Aran and Evan have to defeat them and get the doll for a quest. Found in Sleepywood's Ant Tunnel Square. The king of the vikings that kidnapped Princess Violetta from the Mushroom Castle. The Black Viking is secretly a fan of MapleStory, owning various plush dolls and bed sheets, and attacks you to prevent his secret from being revealed. Attacks by blowing a kiss at you and breathing out a gust of wind. A dragon monster found in the swamps right outside of Sleepywood. Francis's doll, which has gone rowdy. Involved in a quest in Edelstein's Verne Mine. An undead Mushmom found in Henesys's Mushroom Forest, with exactly the same earthquake attack. Like most undead monsters, it is vulnerable to heal and Holy magic. A stronger dragon monster found in Sleepywood's Drake Cave. A fiery dragon monster found in Sleepywood's Drake Cave. It has an avoidable long ranged fireball attack. An icy dragon monster found in Sleepywood's Drake Cave. It has an avoidable long range ice projectile attack. The guardian of Ludibrium's Seal Stone, which Evan is told to retrieve while being tricked by the Black Wings. This is the strongest of all the drakes, but only a little stronger than Ice Drakes and spawns with them too. Fires lightning projectile magic attacks. Even though it has wings, it can't fly or even jump. Found at the end of the Drake Cave in Sleepywood. A cat-like creature found past the Drake Cave, at the entrance to the Cursed Temple, as well as Silent Stillness 1 and 2. A minotaur-like creature found in the Cursed Temple. It has a ranged lightning attack that can strike multiple players. They run fairly fast. 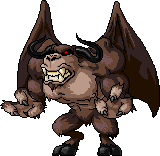 A minotaur-like creature found in the Cursed Temple, near Jr. Balrog. They can use their spears for incredibly long-range attacks. These run slightly faster. A fiery creature found in Orbis. Ice defeats it rather smoothly. Found in Orbis. A Jr. Lioner is just like a Jr. Cellion, except it has different strengths. Ice is still good on it, but it resists lightning. Fast and pesky. Found in Orbis. The third species, similar to a Jr. Cellion, but resists ice and is weak to fire. Fast moving and annoying, like the other two species. Found in Orbis. Must be defeated for Evan's quest line. A wild hog. Kenta's pig must be protected from hordes of Grays to collect its pheromones. After capturing it in the wild at Korean Folk Town, the player can ride this Pig. The second highest-level monster in all of Victoria Island, the Snack Bar being the first. Found in the deepest part of the Cursed Temple, at the Cursed Sanctuary. 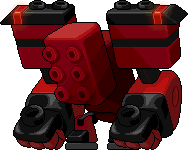 It attacks by dropping a meteor on you, scratching you, and tossing a fireball at you. A clone of Mastema that must be killed to complete the 3rd job on a male Demon. A clone of Mastema that must be killed to complete the 3rd job on a female Demon. The dark clone of Dances with Balrog. In order to advance as a Crusader, White Knight, or Dragon Knight, a warrior must challenge this monster when above level 60 and defeat it. Has a powerful attack that only works melee. Wields a glowing version of the level 80 one handed axe Gaea. While it's hard to avoid in battle since a Warrior needs to go close as well, if you need to heal or re-add enchantment, you can just run away from the clone and he won't be able to hurt you at any distance. He is also able to cast Blind and summons Tauromacis. The dark clone of Grendel the Really Old. In order to advance as a Mage or Priest, a magician must challenge this monster when level 60 or above and defeat it. Uses 3rd Job Mage skills, such as Explosion. Slowest attacking clone and an easy fight for mages, since it cannot teleport, while they can (teleporting at the right moment negates Grendel's attacks). It can also seal and summons Tauromacis. The dark clone of Athena Pierce. In order to advance as a Ranger or Sniper, a bowman must challenge this monster when level 60 or above and defeat it. She is wearing a brown Lineros (level 70 female overall) and wields the famed Dark Arund. The strafe fired by Athena is unusual in that it is only a single powerful arrow. Athena is also able to inflict weakness, which will interfere with jumpshots and evading Athena's attacks. She can also summons Tauromacis. The dark clone of the Dark Lord. In order to advance as a Chief Bandit or Hermit, a thief must challenge this monster when level 60 or above and defeat it. Also uses 3rd Job skills, such as a Hermit's Avenger. Wears a Golden version of the level 60 thief hat Identity, and wields the Dark Scarab and a Dark Stud top and bottom. It can use weaken, which is a disadvantage to assassins, so stay out of it's affliction range. She can also summons Tauromacis. The dark clone of Kyrin. 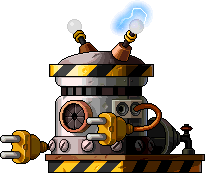 In order to make the job advancement as an Infighter, a Pirate must challenge this monster when level 60 or above and defeat it. It uses many attack skills from both job divisions. Fights with another weaker clone, instead of summoning Tauromacis. The dark clone of Kyrin. It fights alongside the stronger Kyrin. Several of these have broken into Phantom's treasure vault in Ariant. They must be defeated to complete the 3rd job advancement as Phantom. A Crow that steals things. Must be defeated twice in order to advance to 3rd Job as Aran: the first time when leaving Rien, and the second time when it steals a Yeti's jewel. Must be destroyed to complete the 3rd job advancement on a Mechanic, Wild Hunter, or Battle Mage. This page was last edited on 3 March 2018, at 20:12. This page has been accessed 456,719 times.